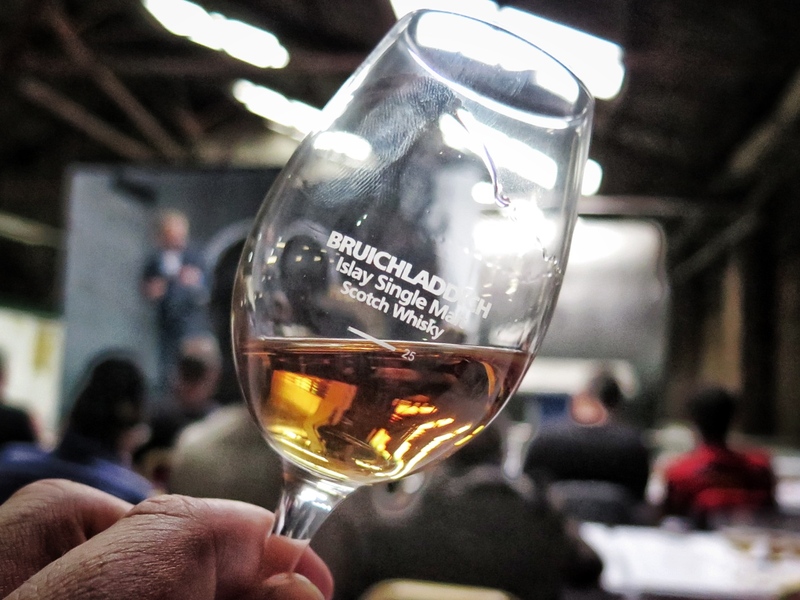 One of the most coveted tickets of the yearly Islay Festival (Feis Ile) is the Bruichladdich Feis Ile Masterclass – a chance for a few hundred of the distillery’s biggest fans to try not only the yearly festival bottling, but also taste hidden delights from deep in the well-stocked warehouses. This year, I finally made it along. While the masterclass was known for years as raucous affair, thanks to retired distilling director Jim McEwan’s table-mounting toasts and rabble-rousing calls to arms, things have become more contemplative since new head distiller Adam Hannett took over in 2016. On occasion, this year’s instalment felt more like a TED talk than an old school whisky-flinging tasting, and it was all the better for it. Bruichladdich has been a confused producer since its reopening in 2000, but the past few years have seen the distillery begin to calm down and consolidate. Gone are the endless limited editions, replaced by a high-quality and easily available core range, with an occasional special bottling still popping up to keep the fans happy. The distillery’s warehouses are still filled with gems, and Adam’s tasting dug deep into the racks to find special whiskies, as well as looking at experiments and potential future releases. This prototype for the next edition was the usual secret mix of casks, with the youngest whisky in the mix from 1990. Nose: Plump raisins and sultanas with hints of char and bitter liquorice pastilles leading to minty hints, fresh menthol and sweet black liquorice sticks. Underneath was a muddy base, dotted with Crunchy Nut cornflakes. Palate: Rich and buttery both on the palate and in texture. The mintyness returned, and Murray Mints lead the charge into a bowl of fruit salad: mango, apple and pineapple. Blowtorched brioche sandwiches thick with butter and brown sugar followed, getting richer and turning into fruit cake with sweet butter icing. Darker notes of singed raisins, charcoal and unsweetened blackcurrant jam balanced out sticky dates. Finish: Butter and black pepper to start, fading through sharp green apple before disappearing in a puff of seaspray ozone. Touches of anise and sweet oak remained. 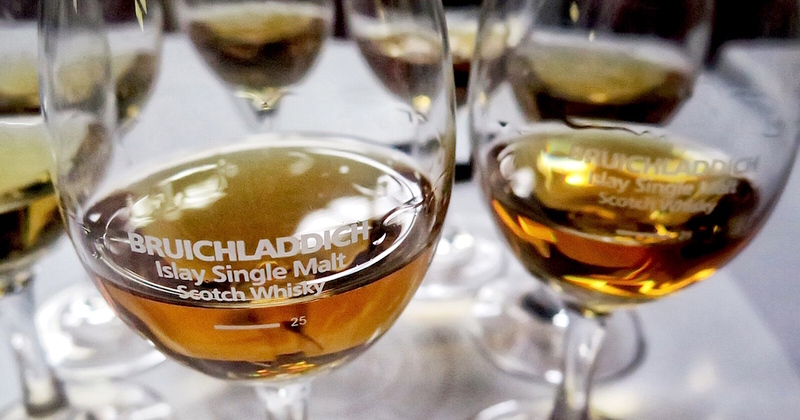 The flagship Laddie Classic is a mixture of whiskies from over the years, starting from 2005. While putting together a batch, Adam wondered what would happen if he batched together whiskies from all the decades they had in the warehouse. The result was this bourbon-matured (legally) 7-year-old dram containing whisky from across five decades of product: 1970, 1985, 1992, 2001 and 2010. Nose: Mango and finely ground black pepper to start, with a background of butter icing. Big fruit developed, with more mango sat alongside sweet and sour apples and poached pears. Woody spice rolled in: nutmeg and cinnamon with polished oak boards and freshly sawn oak logs. Marzipan touches appeared after a few minutes of swirling the whisky around the glass. Palate: Icing sugar and cream diving into a pool of dark fruit and spice. Sweet sultanas and toasted mixed peel were balanced out by charcoal and a touch of barrel char bitterness. Finish: More char, roasted pineapple and menthol, leaving green bark and syrupy sweetness. This whisky was a combination of two vintages, all distilled before the distillery was taken over the by the current owners. First was 1986, the same vintage as the first whisky that Adam presented with Jim McEwan at a masterclass. 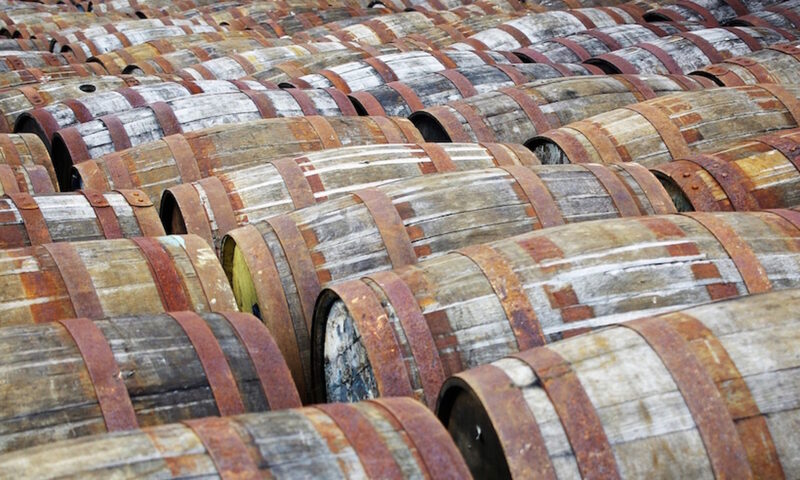 The distillery doesn’t have much spirit from 1986 and all of the casks are sherry butts. In classic Bruichladdich fashion, they didn’t leave the whisky alone and in 2012 they reracked it into fresh Pedro Ximenez sherry casks. The other element of the whisky is from 1984. This time, the spirit was matured solely in refill ex-bourbon casks, before being reracked in 2012 to fresh bourbon casks. Nose: Roasted banana, spiced cream, mango smoothies, freshly scraped vanilla pods, honeysuckle and grassy meadows, and a huge basket of fresh fruit. Palate: Mint and menthol, sultanas and raisins. Brown sugar, mango cream, sour apple and spiced spongecake mix. Darker gingerbread notes with crunchy barley sugar build behind all that, with golden syrup and treacle toffee touches. Finish: Loads of spice followed by stewed apple and a big smack of fruit – concentrated smoothies slowly fading away. 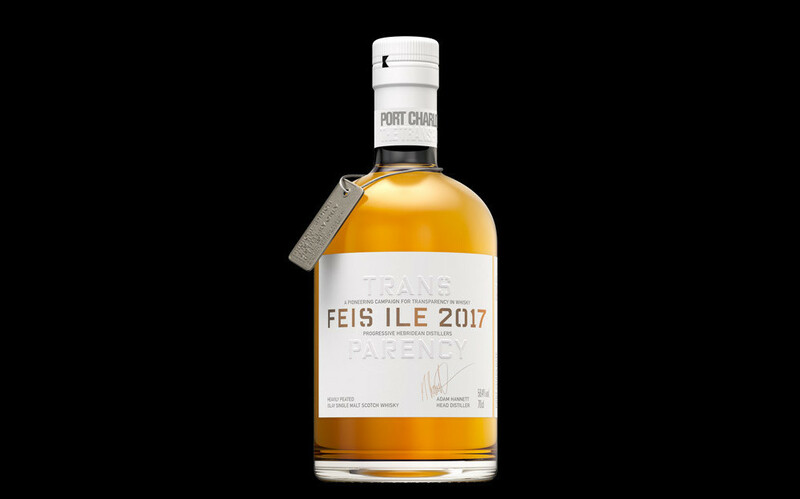 The Feis Ile 2017 release. Bruichladdich’s overriding message over the past couple of years has been transparency, jumping off the back of Compass Box’s campaign. You can now enter the batch number of some of the distillery’s whiskies into the website to get back a complete rundown of the casks that went into the batch. This approach exploits the wording of the EU regulations that forbid advertising the ages of anything but the youngest whisky in a batch – if the customer asks for the information, everything seems to be alright. You can find more details on the Laddie blog. I don’t have a bottle so can’t look up the details and am going on secondhand information as to what’s in the recipe. It’s 12 casks of spirit distilled between 2002 and 2004, a mix of bourbon and sherry casks with a few other Laddie specials in the mix: bourbon finished in Pauillac, full-term Sauternes, Sauternes finish and a vatting of sherry, wine and bourbon casks finished in refill bourbon. Nose: Overripe mango and pineapple, high butter slathered on Sherbet Dip Dabs, incense and sugar crusted fruit cake (Mr Kipling’s Country Slices) drizzled with orange-zest-infused cream. Under all that was a slab of stony minerality, hints of sea breeze, fresh peat smoke and muddy earth. Palate: Barrel char and shrivelled raisin sweetness with dark notes balanced by poached apple, pear drops, barley sugar and sweet cinnamon. A concentrated core of black pepper and spice sat on top of green ferns, mulching green leaves and controlled, integrated smokiness. Finish: Cooling spice and herbs: mint and menthol. Char rolled in with some cinnamon heat and more minty hints. Nose: Smoky yellow and green jelly babies with gravel, fresh ferns and smouldering green leaves. Fruit then jumps in with a vengeance, with fruit gums, fruit salad chews and fragrant orange peel bursting out of the glass. A drop of water calms things down and reveals more of the whisky’s earthier side: twigs and pine. Dark cocoa and grainy chocolate brownies bring up the rear. Palate: Sweet smoke starts, but it’s austere and mineral heavy. Barley sugar and glacier mints follow, with burning ferns, aniseed oil and liquorice. It’s hot and demands water, which adds more sweetness and complexity. Layers of orchard fruit, more menthol and mint, clove, nutmeg and hints of sweet chocolate and grain – rocky road. Finish: Burning pine needles fade to leave Fox’s Glacier Mints and apple-flavoured Jolly Ranchers. Liquorice and blackcurrant sweets fade in along with hints of chocolate. One of the more simple whiskies on the mat, but also one of the most anticipated. A bourbon-cask-matured five-year-old Octomore, distilled in December 2011 and peated to ‘just’ 150ppm. All of the .1 releases of Octomore are five years old and matured in bourbon casks – ‘This could be Octomore 08.1,’ said Adam. Nose: Sweet candied peel, sea spray and hints of bacon. Sharp apples and caraway touches jump out, along with mulching leaves and ferns, peach, lemon wine gums and burning orange peel. Palate: Grain-forward and ashy to start – like munching on a handful of Octomore-spec barley. However, once you get beyond that, there’s much more going on: smoky liquorice, stewed apple, dark chocolate and chocolate malt, and layers of oaky spice. Finish: A smack of unexpected fruit quickly fades, leading to damp peat smoke and ash. A contemplative dram to finish, looking at the start of most Bruichladdich products – ‘What if we did this with a whisky?’. This harks back to 3D3, Waves and Peat, whiskies that mixed together the different makes that Bruichladdich produces. This was a mixture of Bruichladdich (unpeated), Port Charlotte (lots of peat) and Octomore (stupid amounts of peat), combining a range of different cask types. The oldest whisky in the mix was Bruichladdich 1990 matured in Fernando de Castilla PX casks. The youngest was 2010 Sauternes-matured Octomore. The only other component Adam revealed, was some 2003 Port Charlotte. 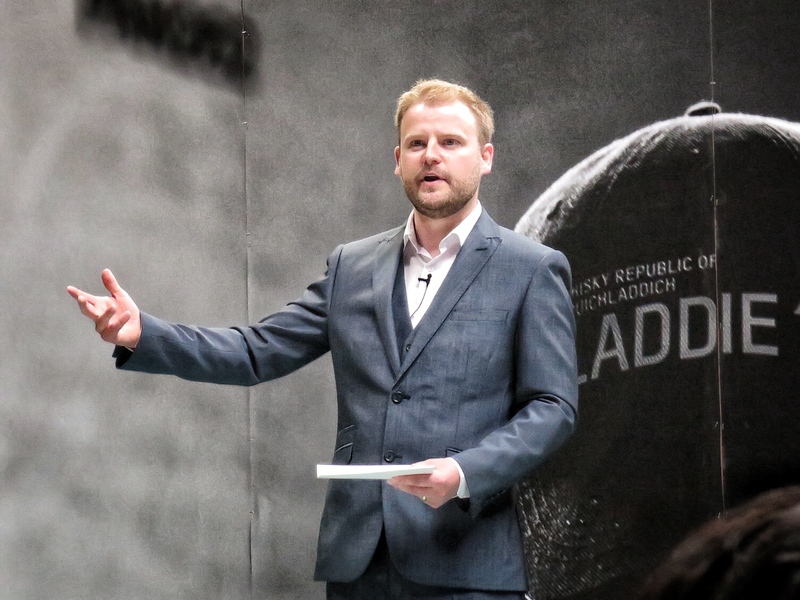 ‘If this was going to be your first taste of Islay whisky, this is how I’d want it to taste’. Nose: Sea-spray ozone, damp rock, beach fires and rock pools. Muddy peat and hints of cream cheese appear, with sliced apple and white grapes – a fruity cheeseboard by the stove. Vanilla cream and fruity puree notes build and take over. Palate: Rich and buttery, with loads of fruit – candied mango, milk and white chocolate, and stewed apple. Menthol touches creep in around the edges along with coal smoke. Finish: Ashy smoke fades to cream and apple. Many thanks to Carl Reavey and Christy McFarlane for inviting me along and somehow making ‘a guy with a beard’ enough of a description for the distillery staff to find me in the queue.